Editors' Picks: 20 of the Best Things to Do in South Carolina! South Carolina, also known as "The Palmetto State," was the eighth state to enter the Union (1788). Less than a hundred years later, it would see the start of the Civil War, when shots were fired on Fort Sumter in April, 1861. But perhaps its most significant role in America's history? It was where the first game of golf was played in the United States (South Carolina is home now to 300 public and private courses, with Myrtle Beach considered the "golf capital of the world"). Even more so than Georgia, South Carolina produces more peaches than anywhere else in the country. The state claims many famous citizens, including activist Jesse Jackson, singer James Brown and comedian Stephen Colbert. It's home to one of the oldest trees in the world, and the first public library in the original American colonies. Need more to explore? Check out our collection of 20 of the coolest things to do in South Carolina. It's Charleston's most visited plantation, and for good reason: it's utterly breathtaking. Founded in 1676, the gardens have been attracting people since they were first opened to the public in the 1870s, and are among some of the oldest unrestored gardens in the country. On April 12, 1861, the first shots of the Civil War were fired at this historic site, as Confederate forces lobbed artillery at this Union garrison in Charleston harbor. No one at that time had any idea how those shots would impact the country at large. Over its 295 acres, you can wander among a wildflower meadow, butterfly garden, trails and streams - and inhale the heavenly scent of over 300 types of that typical Southern flower, the camellia. It's one of the great maritime mysteries of the Civil War: The Hunley, an experimental submarine, rammed and sank the Union ship, Housatonic. Then it vanished under the waves for seemingly no reason. Since its recovery, tours allow you to view it within its conservation tank, and to gaze upon the personal artifacts of the men who went down with the ship. 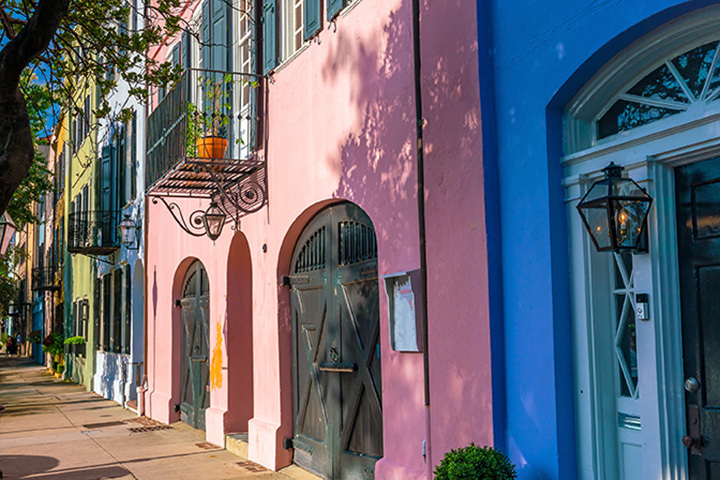 Charleston is considered one of America's most beautiful cities - and Rainbow Row, a series of colorful historic houses in that city, is a must-see. Painted in pretty pastel colors, these restored homes are among the most photographed locations anywhere. Get out of the heat and explore the state's first legal "'shine" distillery. There's an interesting tour - and tastings of various types of moonshine. Might want to have a designated driver handy. It was meant to be a shortcut to the Ohio River Valley, but this unfinished pre-Civil War railroad tunnel has since become a cool tourist attraction. Even on hot summer days, there's always a refreshing breeze blowing through it, and the nearby waterfalls are another lovely bonus. This magnificent tree has weathered storms, floods and other environmental challenges for nearly 500 years (although some age estimates range as much as 1,500 years). As you stand beneath its enormous branches, just imagine what it's witnessed. Summer means the beach, and this town is one of the top beach destinations anywhere. Soft sand, fantastic waves and an amazing boardwalk - what more can you ask for? This Greenville park has been a soothing oasis for well over a decade. Stroll through gardens punctuated by waterfalls, stonework and public art. Over 300 species of birds hang out here, making it a paradise for birdwatchers. In fact, it's considered one of the best destinations in the state. It's a fantastic way to explore the night skies of autumn, but this beautiful planetarium also does amazing shows covering crazy weather phenomenon…even the life of a cell. Mind blowing. Get in some autumn hiking, picnicking or camping at this popular park, which offers some astounding views. It borders North Carolina, so you get two states' worth of beauty in one shot. This 112-mile roadway was once used by the Cherokee as well as fur traders from England and France. Today, it offers spectacular fall foliage views as it winds among the southernmost portion of the Blue Ridge Mountains. There are also plenty of interesting stops along the way. Well worth the drive. This kitschy place is the result of one man's insomnia. During bouts of sleeplessness, Dalton Stevens began covering anything he could think of with buttons. It's since grown to this hangar-sized museum, where you can gaze upon everything from a hearse to an outhouse and more, all covered in colorful buttons. Because, why not? Built in the 18th century, the Old Exchange is one America's oldest buildings, and served as a major trade center for Charleston. On the flip side, the nearby Provost Dungeon housed shady characters of the day. With videos, artifacts and more, both buildings offer a fascinating look at life way back when. This historic military school (established in 1842) is situated on a gorgeous campus on the Ashley River. Visitors are welcome. If you can make it on a Friday, you can take in the regular parade of cadets - an amazing precision event. Every holiday season, Ripley's Aquarium in Myrtle Beach hosts this popular event, with 50 different Christmas trees, each decorated to represent a different state. What will your state's tree look like? It's billed as the state's largest, free New Year's party. Set in Columbia's historic downtown area, there's music and pretty righteous fireworks at midnight. Best of all, there are plenty of hotels within walking (or staggering) distance. Just south of Myrtle Beach is this charming fishing village, widely considered the "Seafood Capital" of the state. There are plenty of great restaurants, and even chances to head out on a fishing charter and catch your own dinner. Or just take in the tranquil surroundings of the town during the quiet winter months.